2001 V70XC with 131k miles. Replaced rear driveshaft, driveshaft bolts, ball joint, exhaust gasket, angle gear, t-case fluid. LF axle shaft, Wheel seal. Camshaft seals X3, crankshaft seal, t-belt kit & water pump, serpentine belt, cam plug. Wheel hub assy, oil & filter. Obviously the previous owner stuck a lot of bucks into it. Adjusted exhaust cam timing, visually it appeared to be off by 1 tooth. The cam was rotated counterclockwise 1 tooth. I rolled it clockwise 1 tooth. Verified, re-verified, triple verified timing was correct. I bought this car recently for $1k, listed for sale with an "undiagnosed engine issue". It was a dead coil on cylinder #5 causing a misfire. Before driving it home I replaced the coil & obviously it ran much better, but was still very underpowered & making very little boost (4-6 psi at most). I cleared the misfire code, which was accompanied by a catalytic converter code and a P0014 (exhaust cam over advanced (Camshaft Position “B” – Timing Over -Advanced or System Performance (Bank 1)). I then adjusted the timing, triple checked timing after adjusting & running the car - all spot on, according to the cam sprocket & crank markings. 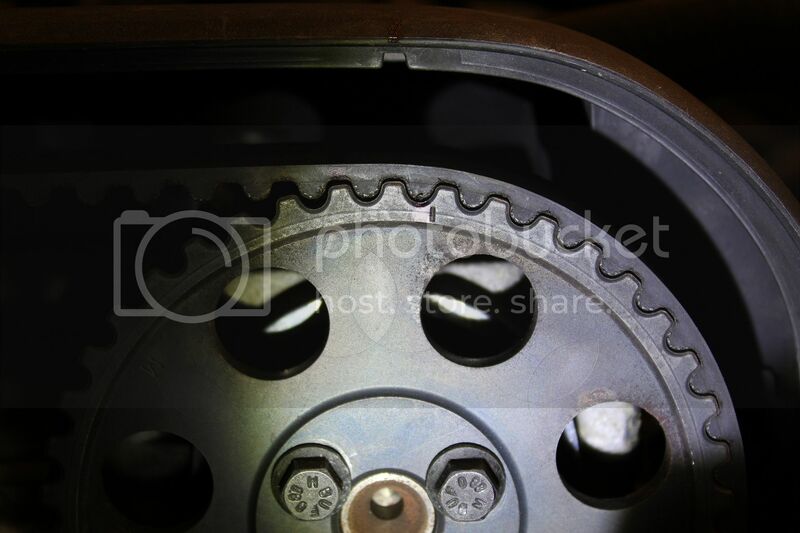 Since the dealership did the crank seal, cam seals & timing belt all at the same time I can only assume that they had the sprockets off the cams to replace the seals. 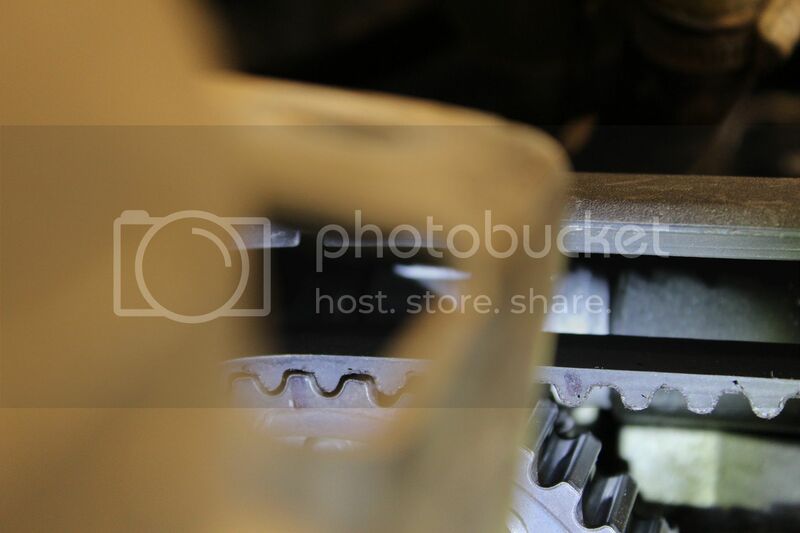 Whether or not they got the sprockets lined up exactly right before torquing them down I cannot say. Just going by the marks on the cam sprockets & crank though, everything is lined up after my exhaust cam adjustment. On cold starts it seems to start mediocre, idles ok, but as it warms up it seems to develop sort of a "loping idle". From cold, when it begins to run rough, if I unplug the VVT solenoid connector it immediately smooths out. Hot, the engine lopes constantly & if I unplug the VVT solenoid connector idle smooths out immediately, then when I plug it back in usually the engine will die. Obviously this makes me want to point my finger at the VVT solenoid. But it ohms steadily at 4 ohms cold & 4.9 ohms hot, which seems to be within spec. I would swap one of our other cars VVT solenoid but they all have the newer style electrical plugs. Also, I notice that the BCV/TCV (Boost control solenoid/valve, small gray device (has 3 vacuum tubes going to it) that clips on pass/rear corner of airbox) occasionally clicks rapidly, sometimes after shutdown for several seconds. I tried one from one of our other Volvos & it didn't click, but also didn't make any difference in the loping idle. The catalytic converter code & misfire codes are still cleared, the P0014 keeps returning. Does this P0014 sound most like a VVT timing advance issue? And if that is the case, would replacing the VVT solenoid be the best place to start? Camshaft reset valve (solenoid) is slow. Check the wiring, Oil pressure and Oil quality before you start throwing money at it. These engines are picky about the Oil. 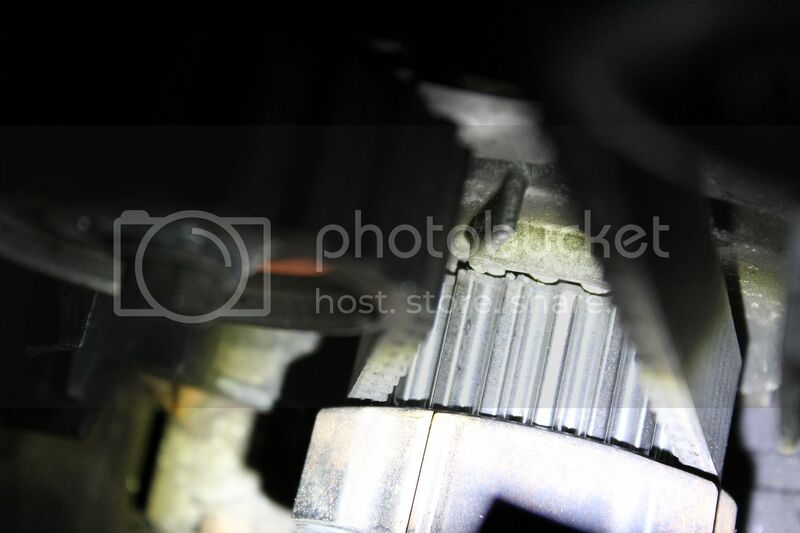 mechanical fault in the Variable valve timing (VVT) unit. Wouldn't the highlighted part of your reply indicate the solenoid is or could be faulty then? I have just changed the oil & filter, 5W30. Oil psi is tested by manual gauge, is it not? I do not have Vadis/Dice, maybe oil psi is viewable with that, not on my tablet running Torque app though. Are the solenoids "serviceable"? Assuming a new gasket is mandatory, I've considered next removing the original one to see whats inside. I could be anything under Possible source. I highlighted the low lying fruit that is easy and inexpensive. Some of the solenoids can be disassembled cleaned up and reassembled, some cannot. The "serviceable" ones have a bolt to remove the solenoid from the housing. I'm pretty sure you have the new type that cannot be serviced. You need a gasket. Volvo part number 30731212. One other thing that is not listed above is sludge in the oil galleries between the solenoid and the VVT. While running, if I unplug the VVT solenoid connector it immediately smooths out. Hot, the engine lopes constantly & if I unplug the VVT solenoid connector idle smooths out immediately, then when I plug it back in usually the engine will die. Obviously this makes me want to point my finger at the VVT solenoid. But it ohms steadily at 4 ohms cold & 4.9 ohms hot. Visual inspection of the wires under the plastic covers show no pinches or exposed wires, although I haven't stripped off the remaining loom. I removed the VVT solenoid & tested it with 12V. This being the first I've removed & tested it definitely plunges when 12V is applied. Whether it plunges "enough" I have no reference point. With it on the bench I tried to clean it as best as I could, for it being the non-serviceable type. After using a toothbrush & alcohol I immersed the valve body (not the solenoid portion) in alcohol & applied 12V many many times for about 25 minutes. Quite a bit of gunk came out. It seems to have a "pumping" action when powered. I reinstalled the solenoid with the original (torn, oops) gasket just to test if cleaning did anything. Rough-ish initial start (after turning engine over with injector fuse pulled). Then back to the loping rough idle. Now, though, it doesn't matter if I unplug the VVT solenoid connector, no change whatsoever. I cleared the 0014 code and re-scanned & it came back up. I haven't taken any vehicle to a dealer since about 2009, just stubborn & unwilling to pay out the nose for stuff I can fix. The solution to this one seems to be more evasive than I'm used to with our other Volvo's. For kicks, I cleaned the MAF & restarted. Rough initial start, but ever so slightly smoother cold idle, but probably unrelated. I gave the throttle a kick or 4 just to see if the loping changed with RPM, it does seem to run smoother with a few additional RPM's. Goosing the throttle though, it sounds like there's a sock in the intake, sluggish RPM ascension, and when letting off the throttle sharply there is a "popping", after-fire type sound. Not being able to have my ear under the hood while goosing the gas, I'm not sure exactly which quadrant of the engine compartment it is emanating from. I ordered the solenoid kit from FCP, should be here tomorrow. None of the junkyards have any older Volvo's with engines in them. The one yard that does, won't sell just the solenoids, have to buy the entire head if that's what you're after. I've gone through the timing on this thing many times now. After thinking and re-assessing numerous times, I decided to roll the exhuast cam back one tooth. I mean if it ran that way before I "advanced it" 1 tooth, no harm. I figured if the code it's generating is that the cam is too far advanced, advancing it further isn't doing anything good. So I set it back to where it was. 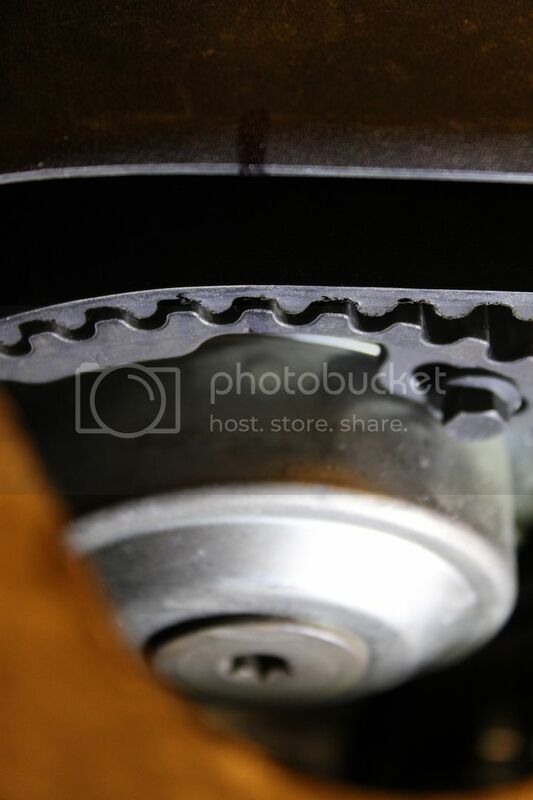 After un-doing what I did, it looks like actually the intake cam is off by a tooth, or part of a tooth, or am I delusional? In addition, I felt the VVT hub for play, and there is a miniscule amount, not as severe as this guys, but there is a tiny bit. The other thing I forgot to mention that I've noticed is with my foot on the brake & trans in Drive, if I slowly bring the RPM's up the instant the tach hits 1,200 the engine feels like there is a sudden boost in power & jumps maybe 250-300 RPM's and the car sort of "lurches" forward. Obviously it doesn't actually move, but it wants to. Then letting off the throttle, loping idle ensues.